Copy and paste the following in the comments and fill it in. Post both AFL Fantasy Classic and Draft results. Listen to the boys go live every Monday from 6pm AEST on City Park Radio for the AFL Fantasy Hour. This then becomes the podcast that you can hear on the website or on iTunes. Listen via www.cityparkradio.com or search for the station in the TuneIn app on your smartphone. Vent/Brag/Whatever: rank 1 yeh boi… also not having danger!! but did lumber myself with Zac. Studs: Lloyd (C through loophole), Grundy, Gawn, and basically every single mid (lowest score was cousins who go injured and still got 71). Couldn’t loop-hole…29 playing plus D.Cameron. Duds: Oh boy where do I start! Top down I guess. Welcome to the week of hell. On the Chopping Block: Did a double downgrade last week for Libba and Stack so have cash in the pocket so am thinking of going Aish & Crisp -> Stewart & Whitfield but also want Rocky back in the mids so have some tough decision ahead. Vent/Brag/Whatever: Went Rockliff -> Libba and B. Scott -> Stack for cash gen. as question marks were hanging over Rocky and O’meara’s heads for this week so didn’t want to risk the potential for late outs costing me a donut. My plan was then to go Setterfield back up to Rocky this week with a sideways trade on either Crisp or Aish. My trade to Crisp after his 142 has really stung. Went Witherden -> Crisp last minute over T. Stewart with the thought that Collingwoods game style was going to open up some great opportunity for him this year. Since making that trade Witherden has gone 100+ and then another decent score this week, and the same with T. Stewart with a low score of 97 for the season. Crisp however has delivered a 40 something and now a 65. Biggest backfire trade for me so far, it’s hard to swallow the wasted trade and cash but he’s gotta go this week! Not to mention the $80-90k swing it is to do now as opposed to 2 weeks ago. Studs: Whitfield, Lloyd & Laird….Cripps, Taranto, Cogs,Walsh….Grundy & Gawn….No studs in forward line in fact if I had a forward line coach I’d sack him. Vent/Brag/Whatever: Conviced myself last minute that Treloar and Grunday were gonna go huge on Friday night so didn’t loophole Lloyd. Asked my bro in-law who to put the C on out of Treloar and Grundy and he scoffed at the idea of captaining a ruckman. Famous last words.. In a massive stroke of luck though I accidentally left Marty Hore on the field (was my non-playing captain in last weeks loophole) and he was stellar! We might shelve this article from now on. People can post their final round scores in the Lockout Chat article as the new My Team post is usually up an hour after the last game (lockout has been lifting pretty quickly!). 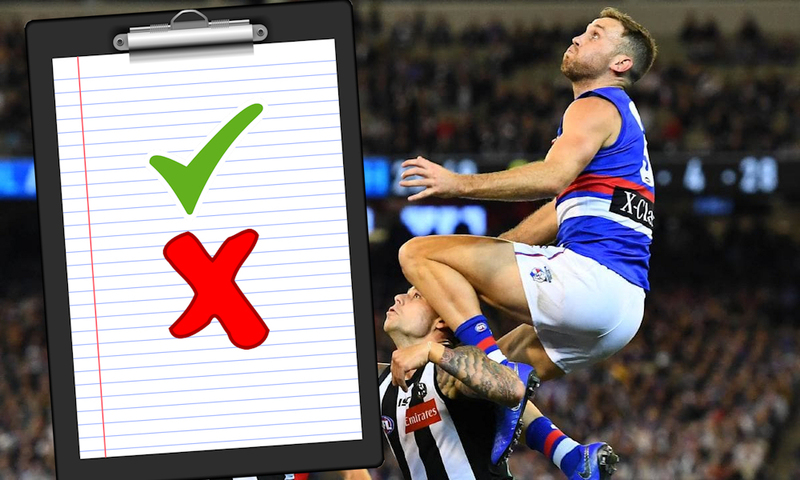 Talk about your round 23 Grand Final hits and misses.